« NIKON D850 LENS PROFILE PROBLEM? It’s been a hot summer where I live in Oregon. Too hot as far as I’m concerned. I’m not a fan of really warm weather, much preferring the “fleece pullover needed” sort of days. When I read a recent email calling me to task for not posting any images for quite a while…well, I looked back at what I’ve done photographically so far this year. Perhaps looking at some winter photos will help me cool off. 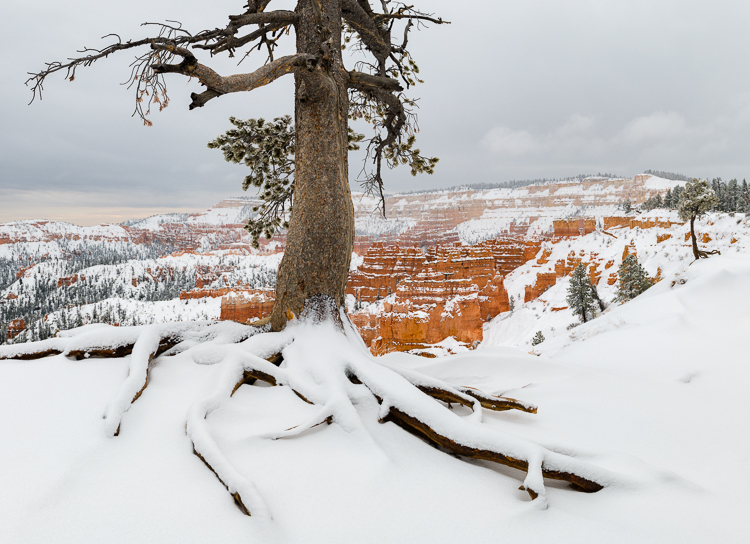 In late January I made a trip to Bryce Canyon National Park, specifically hoping to time my trip with a snow storm predicted for the higher elevations in southern Utah. 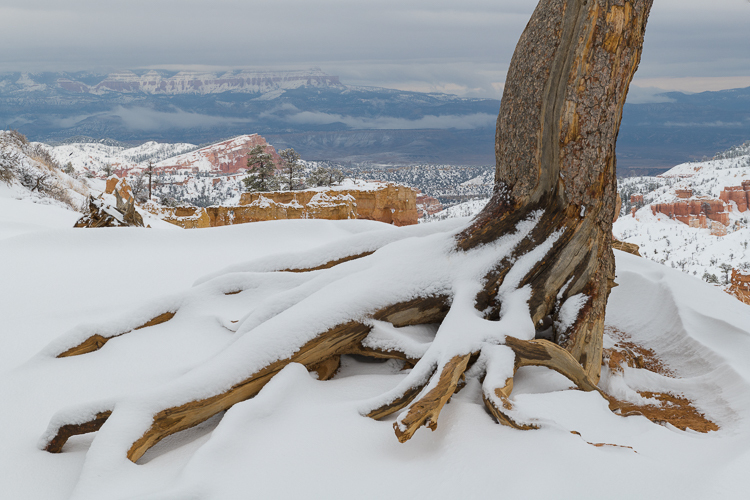 I was hoping to get images of fresh white snow on the red Bryce formations, well knowing that such conditions wouldn’t last long. 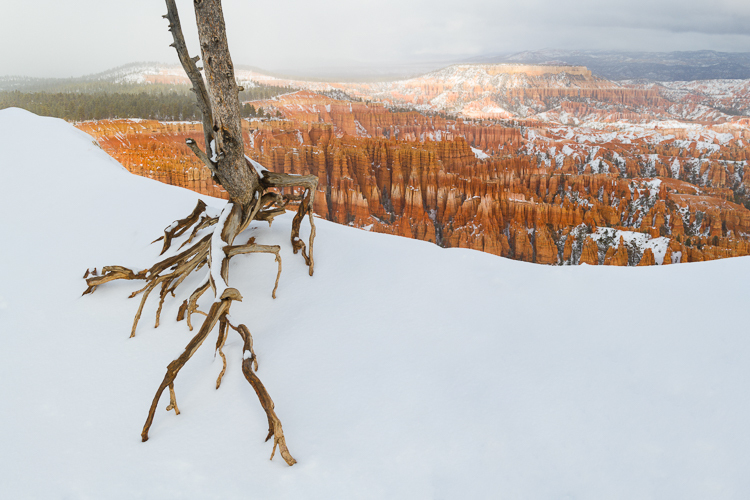 I got lucky and made it to Bryce just as the snow was about to hit, and photographed at Bryce for the next six days. Opening my Lightroom catalog and reviewing images taken on that trip certainly makes me feel better (it’s in the upper 90s here today!). Of course I took a lot of overviews of the Bryce amphitheater, but I was drawn to the trees clinging to the canyon rim. 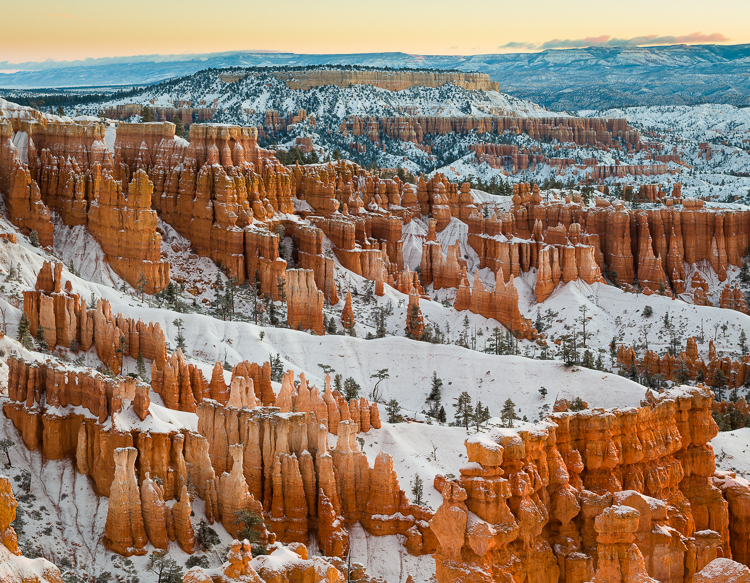 A winter morning at Bryce Canyon. This entry was posted in Location, Travel. Thanks, John! Cools me off a bit, too here where we are experiencing tropical humidity and heat. Love these. Makes me wish I was there.